THE INGREDIENTS for a perfect game are rarely produced, much less is there an agreement whereby the proposed candidate is unanimously elected. However this offering from EA Sports should get everyone jumping out of their seats. Released on the eve of the basketball season. We are treated to a near perfect graphical display of game-play, style, and downright awesome movement � without being too bold on the game�s programming and allowing it to run on older machines. NBA live 2003 contains all of your latest basketball stars and heroes, with a nice fantasy draft team of your own to formulate - one feels spoilt. But, we are never going to be treated so lavishly without some faults. At first controlling the game can be difficult at first for beginners, as the number of keys can be a little complicated than games of a similar vain from previous years. Also the crowd seem somewhat two dimensional as is their movie shots, which are typically an example of this software companies releases from this year. Perhaps this is the next direction for EA to develop? However the positive side is that once mastered, this game has all the elements to which addiction, interaction and compelling play are warranted. Other facets of this release are that mp3�s with the presence of Snoop Doggy Dogg added to the ultimate �cool factor� which EA have gone at lengths to emphasise with this game. 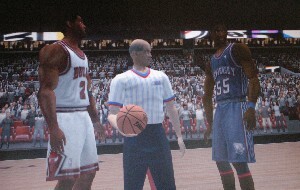 Does NBA live 2003 compensate for the real thing? No, but it gets damned close - EA�s market on computer sports games and their approach on this particular release illustrates perfectly why their dominance will remain unchallenged for years to come. Whatever your thoughts are about sports games on the PC format. 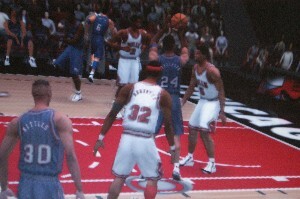 This basketball game is set to �slam dunk� its way all through 2003. BACK in the days of small hard drive space and limited ideas of games developers for the PC. Puzzle games were popular phenomena among gamers. Despite the mass release in the past few months, Pusher still stands out among the best of them due to it�s low resolution low, low interaction and highly compelling puzzle format of game from this release. Puzzle games in most game players minds have been long since forgotten. Yet this daring release proves that philosophy more than wrong. It is a cheeky little game that�s short, thought compelling and can actually help with your organisational skills in your own life (god forbid!!). As you are challenged with an assortment of different coloured balls, which you must push around the inside of the square - matching the correct array of colours to progress through the levels of the game. Ironically this may not be the next blockbusting title to hit your screens. Its size may also be a little off-putting, as it seems miniscule by comparison to releases of the day. But the fun factor and the compelling addiction of Pusher is more than paramount as Jowood have more than made amends for any expectation of a game that most have are familiar with these days with this release. Entertaining, fun and very addictive. Lord of the Rings Fellowship of the ring. ON the eve of the release of its sequel film, the two towers, we embark on this famous adventure in game form. Sadly the release is far from the finished article. Poor rendering and its extremely slow pace amounts to nothing other than a torrid affair. As graphically, the skins well forged but by comparison to the rest the game, it make�s a poor contribution to the largely invisible features, as many of the textures seem missing or rather blocky � even on high-resolution settings. Although the story line is well kept and the rather arduous introduction would seem to have an allure to the game�s appeal. From there on in there are few challenges, to entice the player, which further adds to the snore factor of fellowship of the ring. Hopefully the sequel should have better preparation. In the meantime, go see the film sequel and avoid this offering as much as possible. Sorry one more comment�� Pass the bin, quick!